Problem: Closets are where retail goes to die. About 60% of closet items go unworn. Additionally, you aren't always near your closet when you need something. Solution: Make Uniqlo the brand that meets you where you are. Multiple teams worked on this assignment, but my team and I won the final pitch. Rei Innamoto brought our final ideas to Tokyo to share with the CEO of Uniqlo, Mr. Tadashi Yanai and some of our final activations were produced. Introducing Uniqlo EveryWear, an multipurpose App and service. It allows users to keep a digital closet. The digital closet compiles Uniqlo purchases into a user-friendly scroll-through app. It also suggests new clothing and combinations based on your purchase history. It allows you ditch your baggage when you're flying. Using the EveryWear app, you can pick up and drop off clothes at the airport. Just enter the airport, duration of the trip, and type of occasion. EveryWear will suggest clothes based on that criteria and the forecasted weather. It allows you to get clothes at a moment's notice. Whether you’ve spilled something on your shirt or need a nighttime outfit, EveryWear gives you the ability to rent or buy clothing at a moment’s notice without ever going home. All you have to do is find the nearest EveryWear vending machine or Uniqlo retail store via the app. The larger than average vending machines have new and gently used clothing basics. Used clothing costs less and renting works the same way as Redbox, just return the items at their due date. It allows you save closet space or avoid laundry day. 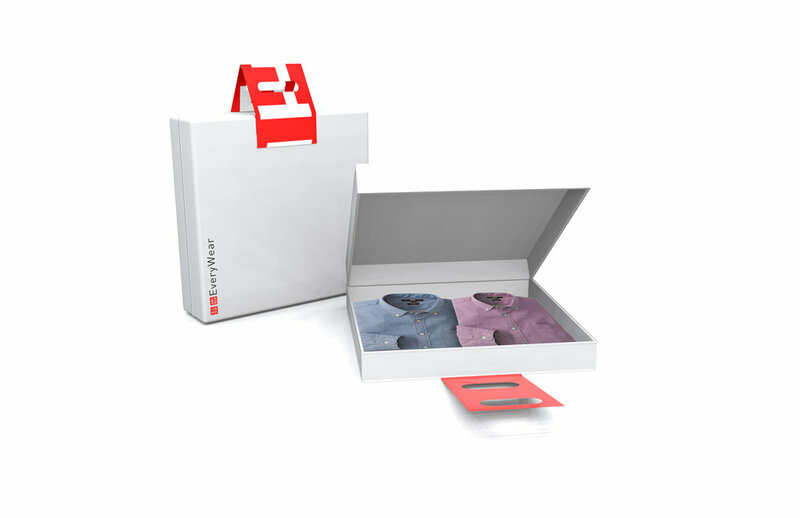 An EveryWear subscription allows you to rent or buy clothing on a weekly or monthly basis, and can be directly delivered through Uniqlo’s courier service to your home or work. Oh and Uniqlo really made our idea and it’s out in the world.